This summer, the Sikhs are working tirelessly to spread happiness by distributing chilled rose milk to passers-by on the roads. This summer, the Sikhs are working tirelessly in the heat to spread happiness by distributing chilled rose milk to passers-by on the roads. Their aim is to simply serve, to bring joy or relief to someone else, and to help someone who needs it. When caste systems in India have divided the public and caused suffering and pain, the Sikh principles have united everyone with no caste distinctions. With a bright smile, they pour you a glass of flavored milk. In the scorching heat, they not only quench your thirst but also uplift your spirits. This summer, the Sikhs are working tirelessly in the heat to spread happiness by distributing chilled rose milk to passers-by on the roads. They have set up temporary camps and they hand over glasses after glasses to pedestrians, rikshaw-pullers, two-wheeler riders and anyone with a parched throat. No one has asked them to do it. They consider this as a means to serve humanity. Serving the people without discrimination and devoting time and energy for the benefit and upliftment of the public are integral parts of ‘seva’ or service .The Sikhs tirelessly engage themselves in such community activities without expecting any reward or anything in return. This selfless service is called ‘Karseva’. The aim is to simply serve, to bring joy or relief to someone else, and to help someone who needs it. With helping others as their only initiative, Sikhs have even removed their turbans to save drowning people as the rest of the world looked on. 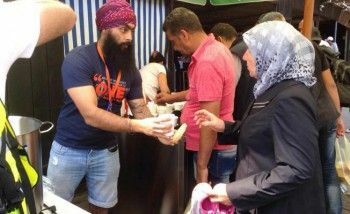 There have also been Sikhs who have set up langars in war-stricken Syrian territory to help refugees. People of all ages take active part in the service. Their service in the gurudwaras, the place of worship of Sikhs is a sight to see. Middle-aged well-to-do men are mopping the floors; women are making chappatis in the kitchen for the langar and kids running with buckets of dal serving anyone whose plate are empty. When caste systems in India have divided the public and caused suffering and pain, the Sikh principles have united everyone with no caste distinctions. Their view of equality is one of the many endearing things found in this faith. The resolve to serve runs deep in Sikh culture. Some of the bravest armymen and sportspersons are from the Sikh community. With all these selfless service, the Sikhs have captured our hearts and have inspired us to serve others. In today’s world, where people run behind fame and fortune, Sikhs engage in selfless service restoring our faith in humanity. its a mark of pride that this Indian community is helping people in such a selfless way. Everyday people engage in langar services in gurdwaras and also clean it. The most beautiful job they have done is to distribute food to Syrian refugees. i am sure everyone knows about the selfless ways of the sikhs. they truly propagate the principle of live and let live. the community as a whole inspires me.